When Queen Mary II died in 1694 and her husband King William III died in 1702, the British throne passed to Mary’s sister Queen Anne in 1702 who bore 17 children through her marriage to Prince George of Denmark all of whom died in childbirth. The reign of Queen Anne was short lived, having only occupied the throne for 12 years. 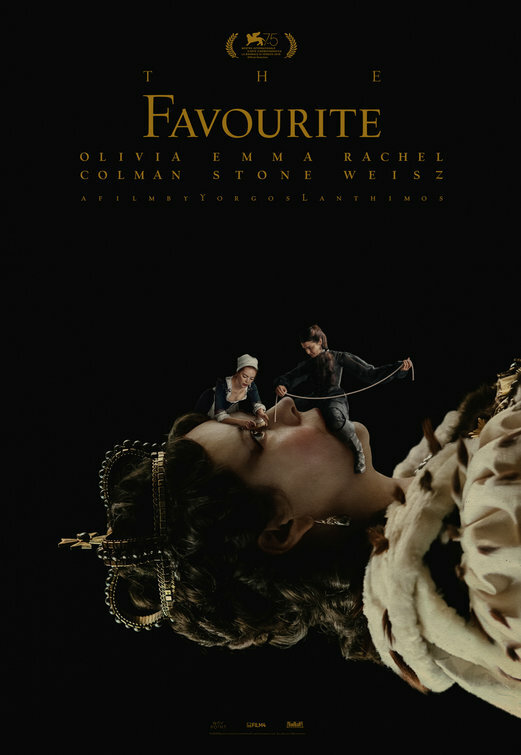 Greek art house director Yorgos Lanthimos provides a bizarre parody of royal favouritism, jealousy and court rivalry in his lavish critically acclaimed period film The Favourite set during Queen Anne’s reign at the beginning of the 18th century. Audiences should note that this is not an accurate historical drama in the vein of director Shekhar Kapur’s epic films Elizabeth and Elizabeth, The Golden Age in which Cate Blanchett played the Virgin Queen. The Favourite is meant to be viewed as a parody. The Favourite is a spiteful royal romp which has three deliciously brilliant portrayals of different women at its core. Oscar winner Rachel Weisz (The Constant Gardner) is absolutely superb as the manipulative and influential Lady Sarah who is usurped in her position at the court by her young cousin a feisty Abigail wonderfully portrayed by Oscar winner Emma Stone (La La Land). Both women are trying to gain favour with the sickly and constantly bored Queen Anne beautifully played by British actress Olivia Colman who gives a career best performance as a Queen who is both commanding and fickle, a female regent constantly plagued by the death of all her children and her inability to produce a viable heir. With gorgeous costumes by Sandy Powell and a brittle inventive script by Deborah Davis and Tony McNamara, Yorgos Lanthimos’s inventive portrayal of British Royalty is both cheeky, outrageous and utterly thought-provoking, a vicious parody of those who hold power and the others who circle precariously around the centre of that regal orbit. Beautifully constructed and wonderfully filmed, The Favourite is not going to be everyone’s cup of perfectly brewed tea but it will certainly challenge viewers’ perception of the pedestal that royalty places itself on. 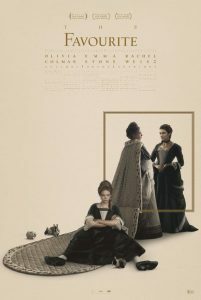 Love it or hate it, The Favourite is a challenging and lavish film about vile characters, utter debauchery and a satirical look at how powerful women can outwit each other, while the vain and ineffectual men particularly Harley played by Nicholas Hoult (A Single Man) and Masham played by Joe Alwyn (Billy Lynn’s Long Halftime Walk) are mere pawns in this whimsical game of deception and influence over a powerful Queen that was equally swayed by her closest companions. The Favourite gets a film rating of 9 out of 10 and is utterly bizarre, a ravishing parody of royalty which will leave an inedible impression on the viewer.